From: Methods in Molecular Medicine, Vol. 105: Developmental Hematopoiesis: Methods and Protocols. Fig. 1. Schematic of differentiation and analysis of human ES cell-derived hematopoietic cells. dissection of timed embryos, there are some fundamental differences between mouse and human embryogenesis that suggest that not all developmental pathways may be the same (5). Indeed, mouse and human ES cells have key differences in their pheno-type, growth characteristics, and culture requirements that likely translate into unique pathways of development (1,4,6). This chapter outlines two methods to promote hematopoietic differentiation of human ES cells (Fig. 1). Isolation and maintenance of undifferentiated human ES cells will not be discussed in detail. Briefly, human ES cells are routinely maintained in serum-free medium either in direct co-culture with irradiated mouse embryonic fibro-blast (MEF) "feeder" cells or in "feeder-free" conditions by culture on Matrigel or laminin-coated plates (1,7). The "feeder-free" growth still requires ES cells to be grown in medium conditioned by MEFs. Therefore, a requirement for feeder cells remains. Some reports have shown other (human) feeder cells can be used to maintain undiffer-entiated human ES cells, thus potentially avoiding some xenogeneic exposures (8,9). Original studies of hematopoiesis from human ES cells used co-culture with stromal cells derived from hematopoietic microenvironments to support or promote development of phenotypically and genotypically defined blood cells (10). This co-culture method is technically straightforward and offers the advantage to potentially characterize and modify the stromal cells to define what components they contribute to the hematopoietic process. Indeed, the finding that nonspecific fibroblasts did not support hematopoietic differentiation strongly suggested that interactions between the differentiating ES cells and the stromal cells were important to support blood development. Therefore, in principle, the stromal cells could be engineered to understand better what cell-bound and soluble factors they contribute to hematopoietic development. Because human ES cells were initially thought to be difficult to modify genetically (many methods used for mouse ES cells required modification for use with human ES cells), the ability to analyze inputs from stromal cells offered an important advantage. However, several recent reports have defined methods to stably express exogenous genes in human ES cells (11-14). Differentiation of human ES cells via embryoid body (EB) formation also offers a suitable method to promote hematopoiesis. 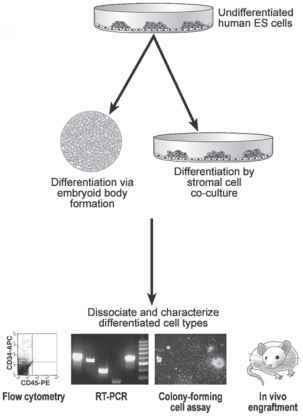 EB formation is an important method when researchers want to avoid more complex interactions with stromal cells. However, as ES cells differentiate, they rapidly become a diverse mixture of cell types. 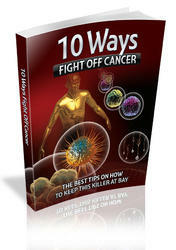 Typically, only a few percent are blood cells. While understanding all components that contribute development of specific lineages will remain a challenge, human ES cells are now an important resource for the characterization of hematopoietic pathways. Moreover, human ES cells offer the exciting prospect of becoming a suitable source to replace or repair cells, tissues, or organs damaged by disease, trauma, degeneration, or other processes. In the methods described in this chapter, undifferentiated human embryonic stem (hES) cells were maintained in serum-free medium. To promote hematopoietic differentiation via stromal cell coculture, the human ES cells were typically co-cultured with the mouse bone marrow stromal cell line S17 (15), although other cell lines derived from hematopoietic microenvironments, such as C166 (16), OP9 (17), or primary human bone marrow-derived stromal cells (18), can be used. After a defined number of days in culture, hematopoietic precursor cells derived from human embryonic stem cells are analyzed by fluorescence-activated cell sorting (FACS), colony-forming assays, and reverse transcription polymerase chain reaction. 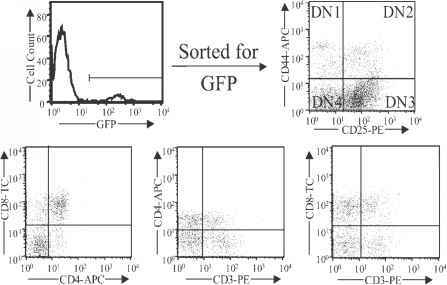 Other assay systems for early hematopoietic progenitors cells, such as the long-term culture initiating cell (LTC-IC) assay (19) or injection into non-obese diabetic severe-combined immunodeficient mice, can be used (20).